If you’re interested in lake properties for sale in South Carolina, set your sights on Lake Murray. Bordering Lexington, Irmo, and Chapin counties, Lake Murray is a 48,000-acre oasis for outdoor enthusiasts and lovers of leisure alike. Everyone is invited to experience Lake Murray for themselves, whether it’s by casting a fishing rod in a shady corner of shoreline, harnessing the wind to sail across the lake’s surface in record time, or simply by savoring a quiet moment with family and friends at sunset. Boasting approximately 620 miles of shoreline, Lake Murray is not only renowned for its stunning landscapes, but also for its premium fishing. Anglers agree that this lake is the beating heart of South Carolina, providing some of the most varied and engaging fishing around. Bream, crappie, and striped and largemouth bass dominate the scene, challenging anglers to a lakeside showdown. If you want to face off against the striped bass, you’ll have to cross into their territory around the Dreher Shoals Dam and let your line down deep—around 60–80 feet. Hang out around (and beneath) the docks for a run-in with the bream, and remember that the best way into the crappies’ good graces is to come bearing gifts— live minnows seem to be their bait of choice these days. If dueling fish isn’t your idea of a good time, Lake Murray still has you covered with countless activities to enjoy on and off the water. The Saluda River feeds Lake Murray, ensuring the water is continually crisp, clean, and irresistible. As such, lake homes for sale enjoy full access to the lake’s many beaches and amenities. Dozens of marinas, boat ramps, and landings dot the landscape, and numerous boat retailers and rental services are also onsite to make your lake experience complete. Dreher Island captivates the imagination with its secluded, adventure-seeker appeal. This 348-acre island features hiking trails, camping facilities, and everything you need for a fun-filled day trip. Lake-view properties are also near Lake Murray’s many other key features, like its stunning array of wildlife. From July through August each year, Lake Murray plays host to the largest migration of Purple Martins in North America. Step outside in the evening and watch the birds fill the skies en route to Lunch Island, their own transitory retreat for the season. Celebrate birdies of another feather at any of Lake Murray’s many area golf courses. If you’d like to live on any of the fantastic neighboring golf courses, visit GolfHomes.com for property listings and details. Lake Murray is only a short drive from such cultural hubs as Columbia and Lexington, South Carolina. Head into the state’s capital for a day on the town and still make it back in time for a nightcap on the lake. Lake Murray is named after William Murray, the engineer who, with his partner T. C. Williams, conceived and persevered until "the world's largest earthen dam" at that time was finished. Their vision of harnessing hydroelectric power here and at the Santee Cooper project brought abundant electricity to the middle part of South Carolina. Work on the dam across the Saluda River was started on September 21, 1927 and was finished on June 30, 1930. The dam itself was built over 200 feet tall. It runs a distance of a mile and a half across. The ground level of the dam is over a quarter of a mile thick. The lake that it forms is forty-one miles long and, in places, over fourteen miles wide. State Highway 6 runs along the top of the dam, giving a panoramic view of the water on one side and the layout of the SCE&G Power Plant below. The lake has over 500 miles of shoreline, and forms an impoundment of over 50,000 acres. To make the building of the lake possible, more than 1000 tracts of land were acquired, and 5,000 people's homes were relocated. In its conception, it gave jobs and cheap electricity to the people of the Midlands of south Carolina, and in its enduring, gives them lasting beauty and enjoyment. SCE&G maintains public access areas at the North and South ends of the dam. The one at the North end provides boat launch facilities. 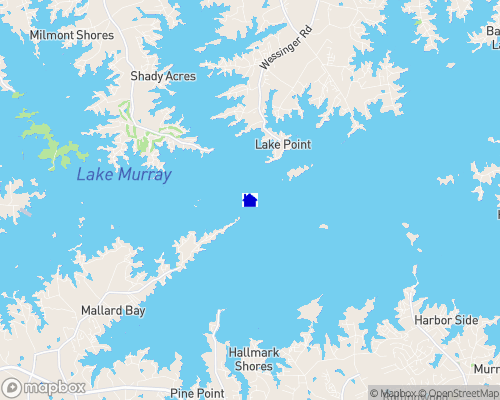 Lake Murray is bordered by four counties: Richland. Lexington, Newberry and Saluda. Local towns include Irmo, Ballentine, Chapin and Lexington. The nearest major city is Columbia, some ten miles from the closest point on the lake. Golf nearby at Timberlake as well as a par three and driving range near Chapin. Lunch Island, also known as Doolittle Island or Bombing Range Island, in the middle of Lake Murray, is North America's first officially designated Purple Martin sanctuary. On summer evenings, boats gather at dusk to witness the spectacle of thousands and thousands of Purple Martins coming to the island to roost. AerialVantage is a South Carolina-based business that publishes custom aerial photography and satellite imagery in poster format as art for your home and office. Irmo, South Carolina Town History The origin of the place name "Irmo" tells the story of the railroad's influence. The town was incorporated on Christmas Eve of 1890 and grew up along the tracks of the Columbia Newberry and Laurens railroad on the high ridge between the rivers. The site was chosen because it was the precise distance from Columbia for refueling the wood-burning locomotives. The town was named by combining the first two letters of the names of two railroad company men, C.J. Iredell and H.C. Moseley.